It’s odd that the most anticipated part of a four-day plunge down the Rogue could be dinnertime, but when dinner is filet mignon served riverside, it makes perfect sense. 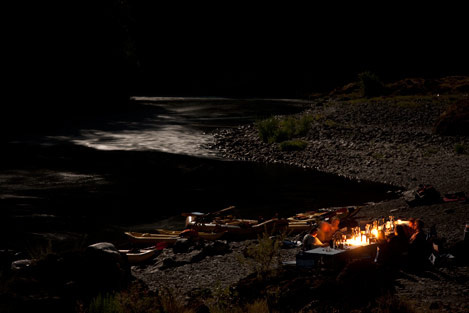 “It’s still a rafting trip and you’re camping,” says Justin Bailie, who snapped this shot under a full moon after a day of running water that ranged from lazy to Class III-plus rapids. “It’s a misconception, though, if you think you’re roughing it.” The Wilderness Gourmet Trip is a fully outfitted mix of hiking, swimming and rafting – but with special focus on the food. A chef and a wine expert are part of the crew, and each night they coordinate a meal more suited to an evening on the town than a campsite. There’s also a built-in incentive to keep paddling and trekking: “The food gets better every night,” says Bailie.